When jackfruit trees started bearing fruit in March, Leelamma thought it better to escape her homestead in Kerala’s Palakkad district. She was exhausted assisting her husband James Mathew in his pursuit of making processed jackfruit products. “I will not return until the jackfruit season is over,” Leelamma told Mathew before she left for Australia to spend time with her children. Sixty-eight-year-old Mathew has been at it for over 15 years. Mathew’s affair with the fruit started in 1998. He would dry, fry, boil and steam raw and ripe jackfruit in a small room all day. “He even sold our coffee estate in Karnataka and spent more than Rs 10 lakh to fund his experiments,” says Leelamma. Over the years James has succeeded in developing a basketful of products. These include a golden-yellow jackfruit wine, dehydrated flakes that can be stored, a health drink, baby food and jack seed powder. But he did not try to find a market for his products or earn money from them; instead, he conducted free workshops every year to train people how to make them. After the training, he would gift them his products. Everybody, including his family, thought he was crazy. “He even got a nickname—Chakka James,” says Leelamma. “Chakka” is the Malayalam word which got corrupted into “jack” and gave the fruit its name. They live in their homestead of 4.8 hectares (ha) in Kanjirappuzha village. The homestead has 60 jackfruit trees of firm-fleshed varikka variety, scattered among coconut, areca nut, cocoa and rubber. Every year, between March and July, each tree bears 50-100 fruits, with a single fruit weighing 10-15 kg. 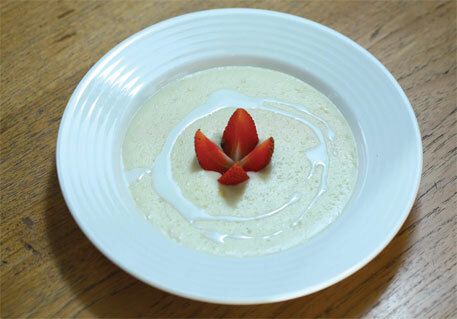 “We use the tender, raw fruit to make dishes and consume the ripe one as it is,” says Leelamma. “But how much can we eat?” asks James. The fruit is so huge that a small family cannot finish even half of it in a day. Besides, once plucked, a mature fruit ripens in two days and perishes in four. So, more than half of the fruits remain on the trees, providing a feast to birds and squirrels before falling and rotting. This wastage pushed James to do something about it. He has also been writing to various Central and state ministries to draw their attention to the wastage. Raw fruit can be a good substitute for meat and the seeds can be cooked, too. 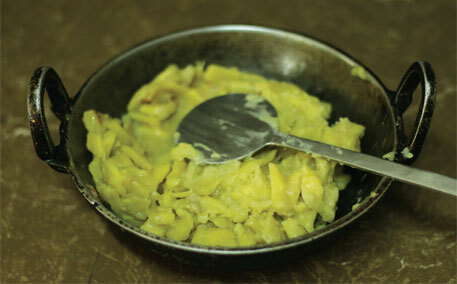 Earlier, raw jackfruit meal was a staple in Kerala’s villages when people ran out of rice and vegetables during the rainy season. The jackfruit tree is easy to grow, requires minimal labour for planting and is resistant to climate change. “We just have to protect the sapling from cattle,” says Mathew. “It never fails, even when all other crops fail.” It can, therefore, be an important food crop. At a time when environment protection agencies across the globe are emphasising on the need to focus on underutilised crops and crops that are resistant to climate change, India—one of the largest producers of jackfruit—should have seized the opportunity. Jackfruit, Artocarpus heterophyllus, is the largest known tree-borne fruit. It is said to have originated in the evergreen rainforests of the Western Ghats. Apart from Kerala, the fruit also grows in Tamil Nadu, Karnataka, Maharashtra, Andhra Pradesh, Telangana, Odisha, West Bengal, Uttar Pradesh, Bihar, Chhattisgarh, Jharkhand, Madhya Pradesh and the north-eastern states. “It is a multipurpose tree that provides food, timber, fuel and cattle feed. It grows best in regions with good rain and sunshine and lives for 100 years. It grows in dry weather, too, if irrigation facilities are available,” says Santosh Kumar K V, assistant professor, College of Forestry, Kerala Agricultural University. The canopy is very large and can keep the microclimate cool. It is also drought-tolerant because its roots extend to the moist sub-soil. “Compared to other tropical fruits such as mango, guava and banana, pest attacks and diseases are negligible in jackfruit. So chemical inputs are not needed to grow it,” says Laila Mathew, professor at the department of pomology and floriculture, Kerala Agricultural University. The fruit also has several health benefits (see ‘High on nutrients’,). Jackfruit IS highly nutritious. It is rich in vitamin A and C, potassium, phosphorus and calcium and iron. 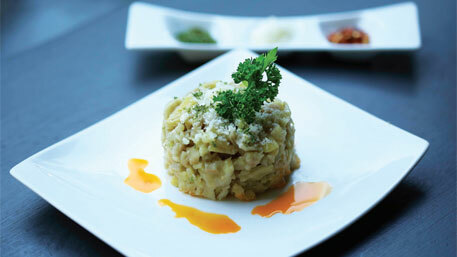 It has 10-12 per cent carbohydrate content, 6-7 per cent protein and 2-3 per cent fibre. It also contains antioxidants such as flavonoids that protect against cancer, degenerative diseases and ageing, says Shyamala Reddy, associate professor, biotechnology department, University of Agricultural Sciences, Bengaluru. A study published in the Ceylon Medical Journal in 2011 says that sugar levels show a sudden dip when raw jackfruit is consumed. Raw jackfruit has good amount of insoluble fibre with low sugar, says J Kannampilly, diabetologist and diabetic foot specialist, Lakeshore Hospital, Kochi. It contains a healthy amount of simple sugar like fructose and sucrose that are easily digested by our bodies. “India does not even understand the potential of the crop,” says Shree Padre, a Karnataka-based journalist, who has been writing on jackfruit for the past seven years and has travelled to South-Asian countries to understand how they promote the fruit. “The fruit, which was staple 40-50 years ago in several states of the country, remains grossly underutilised, Padre adds (Log on to www.downtoearth.org.in for his interview). India wastes more than 50 per cent of the jackfruit it produces, according to K Narayana Gowda, former vice-chancellor of Bengaluru’s University of Agricultural Sciences (UAS). On a conservative estimate, the country could be losing jackfruit worth Rs 2,000 crore every year, he says. More than 80 per cent of the fruit gets wasted in the Northeast, while in states like Kerala, the figure stands at 30-40 per cent. In 2012, jackfruit worth Rs 434 crore was wasted in the impoverished East Garo Hills district of Meghalaya alone. A survey conducted by People Service Society Palakkad (PSSP), a Kerala-based non-profit that also makes jackfruit products, found that nearly 60 per cent the jackfruits produced in Palakkad district are wasted. “There are about 1.2 million trees in the district, yielding 33.5 million fruits. About 39 per cent of the crop is utilised for food and four per cent is exported to other states. The rest is wasted,” says Jacob Mavunkal, executive secretary of PSSP. The economic value of this wasted fruit is about Rs 10 crore, when it is raw, and about Rs 40 crore after processing, he points out. The reasons behind the huge wastage of the fruit are many. B D Tiwari, director of Meghalaya Institute of Entrepreneurship, a state government institute that started promoting jackfruit recently, says that the main reasons are lack of awareness among people and policy makers about the benefits of the fruit, low local consumption, shortage of cold storage facilities and absence of processed jackfruit products. “Above all, there are no policies or funds exclusively to promote jackfruit at the national or state levels,” says Padre. Due to these factors, jackfruit farming has remained confined to small land holdings. JhunuMALIK, a resident of Kanteikoli tribal village in Mohanataluk of Odisha'sGajapati district, takes just two minutes to peel off the hard, latex-filled outer rind of a jackfruit, and she does not use her bare hands. The difficult task is made easy by a wood-plainer used by carpenters. "This small machine has changed my life. Earlier, it used to take 10-15 minutes to peel a jackfruit. But with this machine it is quick. Since I started using this, I am earning six times more," she says. The machine and training in minimal processing was provided to her by the regional centre of the Indian Institute of Horticultural Research in Bhubaneswar. "The machine weighs 1.75 kg. We reduced the weight to 1.5 kg by removing some parts," says H S Singh, head of the centre. "We're trying to reduce the weight to 1.25 kg." The soft-flesh variety of jackfruit grows in abundance in Gajapati and Kandhamal districts in the state. Like Jhunu, many women used to collect the fruit and sell it for Rs 5 per kg to traders, who would sell it as a vegetable in the markets of Delhi and other north Indian cities at Rs 40-60 per kg. 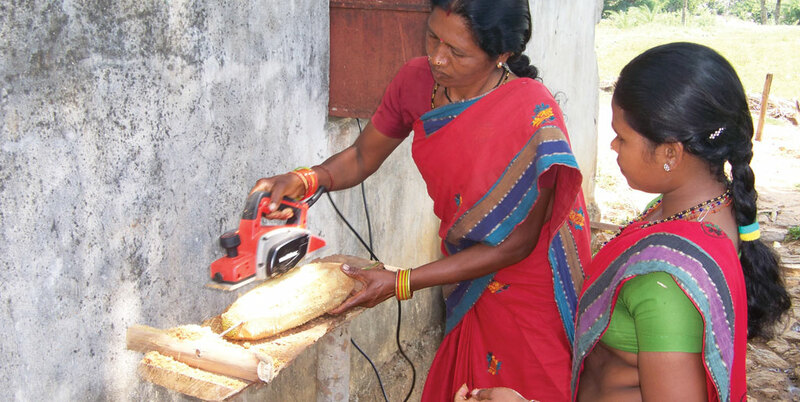 Using the wood-plainer, tribal women in Odisha are enhancing their skills while increasing their income. "Now that peeling jackfruit is much faster, we cut it into cubes, smear a solution to prevent browning, pack it and sell it as a vegetable for Rs 30-40 per kg in the local markets," says Padma Mallik, Jhunu's friend. Both of them are office bearers of a self-help group of 10 women. There are five such groups in Mohana. Each group has one machine, which costs Rs 2,200-2,500. The centre also organiseda training in February this year on the minimal processing of raw jackfruit so that it can be used as a vegetable and sold by the tribal women locally. The only place in the country where large-scale commercial cultivation of jackfruit is being done is Panruti in Tamil Nadu’s Cuddalore district. Here, around 4,000 farmers grow jackfruit as a monocrop in plantations of up to 20 ha. The total area under jackfruit cultivation in Panruti is 1,000 ha. Farmers here follow a simple agronomic practice, called thinning, for producing bigger and better fruits. This helps them earn more money. Excessive fruits are removed from the peduncle at a tender stage allowing only the selected ones to grow. “Here, you won’t find fruits that weigh less than 15 kg,” says Perumal Haridoss, deputy director of agriculture, Cuddalore. Farmers get a steady annual income of Rs 1,50,000 per hectare. Even when they sell the crop to brokers, they earn good money. The fruit is available round the year. Even those who grow jackfruit as a scattered tree in small landholdings can make money, provided there is direct market linkage, as was seen in Toobugere, a block in Bengaluru. Farmers in Toobugere would earlier sell jackfruit to brokers at a throwaway price of Rs 25-30 per piece. But the scene changed after Toobugere Jackfruit Growers’ Association (TJGA) was formed in 2009. Now, an average fruit weighing 15-20 kg gets them Rs 70-100. The association, which is the only body of its kind in the country, was formed as part of a project undertaken by UAS. The project covers 8,340 families in 75 villages in the block. The university has linked the association to Horticulture Producers Cooperative and Marketing Society (HOPCOMS), a big vegetable and fruit outlet. TJGA pools in thousands of jackfruits and brings them to HOPCOMS. “I earn Rs 2,500-3,000 per tree,” says M G Ravikumar, secretary of the association, who has 35 trees. However, most jackfruit growers in the country are not aware of its economic potential. Sunny George, chairperson of Tejaswini, a coconut farmers’ producer company in Kerala’s Kannur district, who has 1,000 jackfruit trees in his 1.5 ha pepper plantation as support trees to the vines, says, “We realised the commercial value of the fruit only when a jackfruit processing unit was set up in Kannur.” Earlier, he would remove all the leaves on the trees to avoid fruiting and would use them only for supporting the vines. The processing unit, Artocarpus Foods Pvt Ltd, set up in May, is the country’s first full-fledged processing unit exclusively dealing with jackfruit. Members of Tejaswini have started supplying jackfruit to Artocarpus at Rs 5 per kg. “We can supply 600 tonnes of fruits a day if there are more takers,” says George. So far they have supplied only 15 tonnes to the company. The rest is rotting. Subhash Koroth, managing director of Artocarpus, says if he could utilise the fruits that get wasted in his district, he would be able to feed the entire state. “I process 200-300 fruits a day. But I’m not using even half per cent of the fruits getting wasted in my district,” he says. 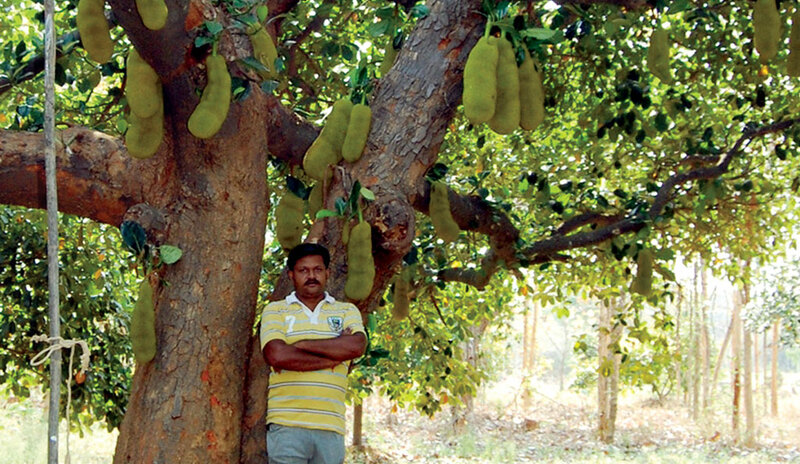 While MOST farmers in the drought-hit Vidarbha region of Maharashtra are devastated by crop failure, jackfruit producers are reaping rich rewards. In the past 10 years, jackfruit cultivation has been spreading slowly in Yavatmal, Chandrapur, Amravati and Gadchhiroli districts. Sixty-five-year-old Kamal Naine Golchcha in Chandrapur district earned Rs 50,000 this year from his two-hectare (ha) jackfruit plantation, where he had planted 350 trees a few years ago. 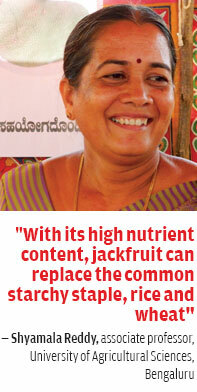 "I get 80-100 kg of jackfruit from each tree," says Golchcha. He owns another plantation of 4 ha, where he had planted 1,100 trees four years ago. "The trees yield only after seven years, but jackfruit will never fail even when other crops do," he says with pride. Ram BhavuUke, a farmer in Kamatwada village in Yavatmal district, earned Rs 40,000 this year by selling raw jackfruit from the 15 trees planted by his father 13 years ago in their 2.8 ha land. 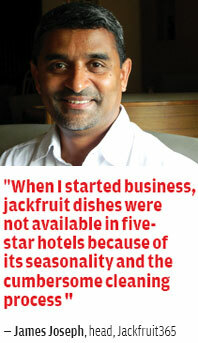 "Raw jackfruit has good demand in hotels here. It is used as dummy meat," explains Golchcha. Raw jackfruit sells well in Nagpur, Vidarbha's biggest city. 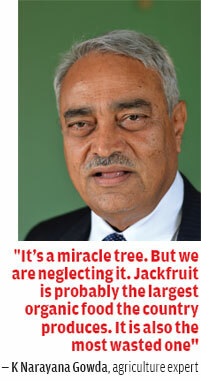 Uke says jackfruit has the potential to enhance the economic and nutritional status of Vidarbha's farmers. He is earning extra money by selling saplings to fellow farmers. This year, he sold 500 trees for Rs 20 each, earning Rs 10,000. 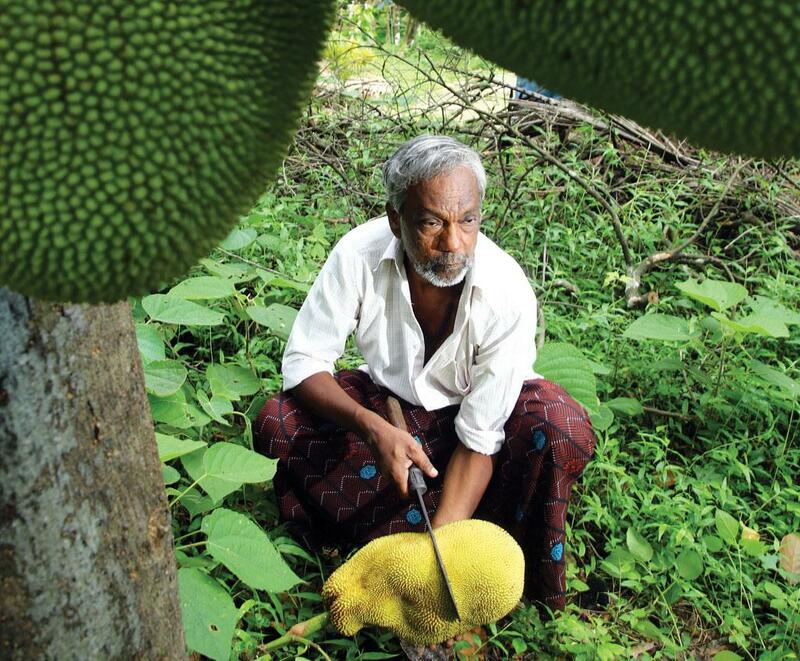 "Many farmers from my village now grow two to three jackfruit trees," he adds. Local consumption and demand for jackfruit remain low mainly for two reasons: the huge size of the fruit and the cumbersome process of peeling its thick, spiky latex-filled rind and scooping out the bulbs. As Leelamma points out, those who are not familiar with the fruit will take hours to make it ready to cook. “Processing jackfruit in ready-to-cook, ready-to eat and ready-to-serve forms is the only solution to these problems,” says K C Misra of eKutir Social Business, an Odisha-based non-profit which has recently started programmes to train women on minimal processing and packing of jackfruit. PSSP, for instance, started making a variety of ready-to-eat products in 2013 at the behest of James Mathew, using technologies he had developed. This year, the non-profit did a business of more than Rs 1 crore. PSSP has four units that manufacture products such as pulp, chakkavaratti (a traditional preparation in ghee), pickle, jack seed chutney powder, flour, honey jackfruit, candy, cake and cutlet. PSSP procures jackfruit at a price of Rs 4/kg from farmers living within 20 km. “With decentralised production, procurement of raw material becomes easier and transport costs are lower,” says Shaji Elanjimattam, chief coordinator of the project. They employ daily wagers for peeling and cutting the fruit, generating livelihood opportunities. In 2013-14, PSSP sold eight tonnes of value-added products from 200 tonnes of jackfruits bought from farmers. 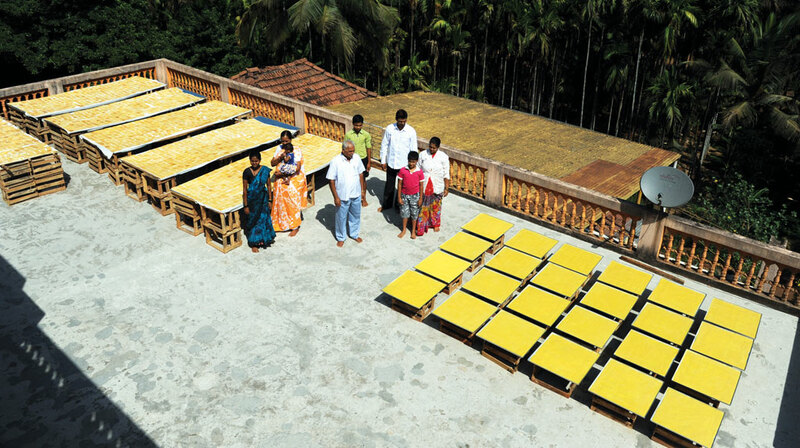 “We paid Rs 8 lakh for 200 tonnes of jackfruit to farmers,” says Shaji. In 2014-15, PSSP bought about 800 tonnes of jackfruit from farmers. And value addition makes a lot of difference. James Joseph, a former director at Microsoft who started an innovative business venture called Jackfruit 365 to supply jackfruit round the year, says that he buys neatly cut pieces from PSSP, transports them in his own vehicle with cold storage facility, dehydrates them using freeze-dry technology and sells them in handsome packets. He also exports his product to United Arab Emirates. “There is demand for jackfruit products; people like it,” says Christine P Robbert, chief programme coordinator at Krishi Vigyan Kendra, Pathanamthitta, Kerala. The farm science centre, which comes under the Indian Council of Agricultural Research, has developed about 40 products and has been training people in making value-added jackfruit items. 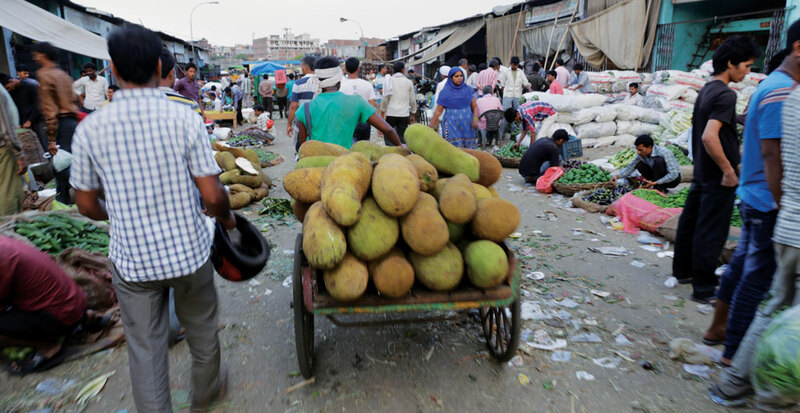 The area has 1,200 ha under jackfruit but about 16 million jackfruits get wasted every season. Konkan Nisarg Manch, a non-profit in Maharashtra’s Sindhudurg district that started making jackfruit pulp in 2007 and commercialised its production in 2012, is another success story. “We had an annul turnover of Rs 57 lakh this year. We also make phanas poli, candy, toffee, burfi (sweet)and jackfruit bar,” says Mohan Hodawadekar, head of the organisation. He says that in the Konkan area, at least 60 per cent of jackfruit are thrown away because they are of the soft-fleshed koozha variety. They are highly fibrous and difficult to eat when ripe. Despite the success of such initiatives, neither the Centre nor state governments have undertaken projects to promote the fruit. “Commercial cultivation and consumption of jackfruit is very low; hence its commercial value is low. There are no Central schemes or programmes supporting jackfruit production and it is up to the states to implement programmes for the fruit,” says Tamil Selvan, additional commissioner (horticulture), National Horticulture Mission. State governments, on the other hand, say that unless the demand for the fruit increases, they cannot formulate special programmes. Sankarsan Rout, deputy director (horticulture), Odisha, says, “The state does not have any fund or special programme exclusively for jackfruit. If utilisation goes up, the crop will be included in the policy.” According to K M Parashiva Murthy, joint director of horticulture (flowers and fruits), Karnataka, farmers prefer to use arable land for major food crops and cash crops because they are more profitable. “Only whose lands are not suitable for cultivating major food crops have traditionally grown jackfruit,” he says. There is a lot the government can do to promote jackfruit. Firstly, the Central and state governments have to recognise the importance of jackfruit as a nutritious and healthy staple. 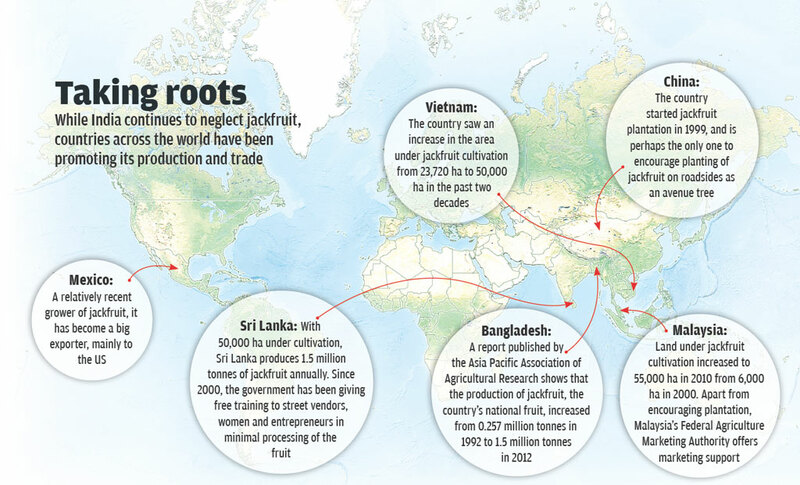 In Malaysia, jackfruit has been made a part of health, food and agriculture policies since 1992 (see ‘Taking roots’,). It must also create a database on the area under cultivation, production and wastage of jackfruit, says Padre. This will help in framing effective policies and projects. Adequate funds must be allocated to rope in research institutes and non-profits to train people in making fresh and ready-to-eat jackfruit products. There is also a need to create awareness among people about the health benefits of the fruit. Shyamala Reddy, associate professor, biotechnology department, UAS, says that with its high nutrient content, jackfruit can replace the common starchy staple, rice and wheat. Promotion of jackfruit can be done by organising jackfruit festivals. A few civil society groups and non-profits are already involved in organising such events. “These festivals attract a lot of people and provide a forum for jackfruit promoters to get together. A lot of value-added products get sold in these festivals,” says L Pankajakshan, general secretary of Jackfruit Promotion Council, a national forum formed in 2012 by activists, Kerala State Horticulture Mission and Thiruvananthapuram district panchayat. In April this year, the council conducted the second national jackfruit festival in Kerala’s Aranmula village. There is also a need to develop cost-effective methods for harvesting and post-harvest handling of the fruit. Local and regional markets must be developed. Kerala, for instance, exports 50,000 tonnes of the fruit to far-off places such as Delhi and Mumbai, while it faces shortage of vegetables. “In places where it grows, jackfruit is poor man’s food. But it’s a rich man’s vegetable in cities,” says Padre. Wherever local bodies can, they should undertake promotional efforts, says Pradeep Kumar, president of Edatwa village panchayat in Kerala’s Wayanad district. His panchayat had prepared such a plan but could not get it sanctioned from the government, he says, adding that Wayanad wastes jackfruit worth Rs 61 crore every season. A newspaper and television advertisement campaign will make a huge difference, says James Joseph. The Coconut Development Board has been doing it for Neera, a non-alcoholic drink, and the Spices Board has done it to promote cardamom. C D Suneesh, one of the directors of Uravu, a Wayanad-based non-profit which conducted the first jackfruit festival in the country in 2006 and has been regularly organising festivals every year, agrees that government support is paramount. “Every season jackfruit festivals are celebrated with good media coverage. But unless the Central and state governments make efforts to promote it, jackfruit will remain a festival fruit,” he says. With inputs from Shreeshan Venkatesh in New Delhi and Alok Bang in Vidarbha. Boil all the ingredients together. Season with salt or sugar. Saute onion, garlic and celery in virgin olive oil. Add jackfruit and saute for a while on low flame. Slowly add vegetable stock and simmer till done. Season with salt and pepper. Add white wine and parmesan cheese and fold into the risotto. Finish with butter and garnish with the remaining cheese. Take out the seeds from the jackfruit. Slice the fruit and cook it in a pressure cooker with some water. Blend it in a mixer. 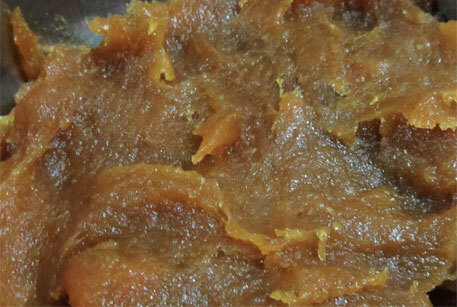 Pour molten jaggery in the puree and cook till the mixture gets thick. Add ghee when the mixture starts leaving the sides of the pan and assumes the consistency of a rolling ball. This can be preserved for over a year. Splutter the mustard seeds and red chillies in oil. Add onion and curry leaves and saute till transparent. Add sliced jackfruit, turmeric, salt, pepper powder and water and cook for 10-15 minutes. Set aside. Coarsely grind coconut, jeera and green chillies. Add this to the jackfruit mix. Cook over low flame for five minutes.